With the emergence of various off-ice training program theories, a handful of ideas or concepts are available for skaters to utilize in their training. The method of Plyometric training should be among the main training components (along with strength, flexibility and endurance conditioning) for complete development of the skater. More specifically, plyometric training is not just for the singles skater who wants increased explosiveness for jumping, or greater eccentric leg development for landing strength. Plyometrics is just as valuable to utilize for pairs and ice dance in order for performance enhancement. Pair skaters can utilize plyometric training not only for jump performance but to increase upper body dynamic power for their respective skill movements on-ice (lifts, throw jumps, etc). 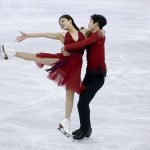 Ice dancers can perform plyometric training drills for Hip/Leg power and speed of movement performing various footwork drills, lateral hops and bounds and other related movements. Also, ice dancers can benefit from upper-body plyometric (arm drills) for enhanced dynamic power to enhance on-ice lifts and arm positioning. The importance of plyometric training specific to these three disciplines, involves speed/strength enhancement of the Hip/Leg, Torso/Abdominal and Arm/Shoulder and Upper Back areas. Training drills need to be appropriate for the age and level of the skater. A general and specific total-body strength training phase should be implemented 6-8 weeks prior to beginning jump/ Plyometric training. Proper progression (intensity) of drills from general motor-skill development to sport-specific. a. Footwear: skaters should wear shoes with adequate ankle/heel support (i.e. basketball or cross-training shoes). b. Soft Landing Surface: mats, cushioned aerobic floor, sprung wooden floor, or soft grass should be utilized for performing drills. c. Boxes: jump boxes should be durable with an adequate non-skid landing surface – Heights for skaters (Preliminary – Senior level) can range from 8″ to 35″ respectively. Explosive takeoff, good knee-bend, arm-swing and appropriate vertical positioning of the trunk, back and head. Control of landing, absorbing (eccentric) the landing with a good positioning of the upper body (arms) head, back and trunk. c. Correct posture or body positioning. d. Quickness (speed) – When landing and taking-oft for another jump attempt, the skater must ‘Minimize” the amount of time spent on the ground or floor. Must be a quick rebound jump. Cad M. Poe, M. S., C. S. C. S., served as the office strength and conditioning coach for the Colorado Springs World Arena, Colorado Spdngs, CO. Mr. Poe has been involved with strength/power training and conditioning training ofskaters beginning with his work at the United States Olympic Training Center and currently through the USFSA at the Elite and Regional Training Camp levels. For any questions regarding plyometric training for figure skaters, please contact Mr. Poe via the PSA directory. « QnA: When should my child start competitive skating?